Not sure if your kid would be interested in reading The Hobbit? Don't take it from me – here's a review written by 10-year-old Luke, who has read the book (wait for it) 15 times. Peace-loving Bilbo Baggins, a hobbit (or halfling) is living in the country of the shire in Middle Earth (more on that later). He meets a strange wandering wizard talking of adventures; Bilbo invites him to afternoon tea and thinks nothing more of it. But instead of just one wizard arriving at Bilbo’s house, 13 dwarves arrive as well. And so begins an adventure beyond Bilbo’s wildest imaginings. An adventure that takes him to the Grand House of Elrond, through the dangerous orc-infested Misty Mountains, past the mazes of Mirkwood and to many other places as well. The author, J.R.R. Tolkien, was a professor of mythology at Oxford, so he knew a lot about myths. He created a world from his imagination – Middle Earth – in which all of his stories took place. Tolkien wrote The Hobbit as stories for his children and not to publish as a book. Later, he was convinced to publish the stories as a book – which has never been out of print to this day. 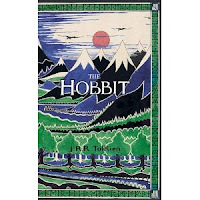 The Hobbit is a great adventure story and is a classic as well as a must-read. I have read it 15 times. You heard me, 15 times! I don’t often read a book more than once. It submerges you into another world and it captures your imagination – taking you to another realm. It paints a perfect picture in your head and it has a really good story line. And when you get that combination in a book, you can read it over and over. The Hobbit was so successful when it was published that Tolkien was encouraged to write a sequel, which became his masterpiece: Lord of the Rings. I love Lord of the Rings, but I haven’t read it 15 times. I think it is because there is a charm in The Hobbit that is not matched in the sequel. So if you haven’t read Lord of the Rings yet, read The Hobbit first. And if you have, read The Hobbit anyway. Luke is a student at Hillcrest Community School. This review was originally published in the school's online newspaper.